A FLAGSHIP new Range Rover Velar has been revealed, packing a powerful supercharged engine. The SVAutobiography Dynamic Edition features a 5.0-litre V8 engine with 542bhp and 680Nm of torque, which combine to push the Velar from 0-60mph in 4.3 seconds before hitting a top speed of 170mph. The car also benefits from upgraded brakes and suspension to ensure that the Velar rides and comes to a stop just as effectively as it accelerates. 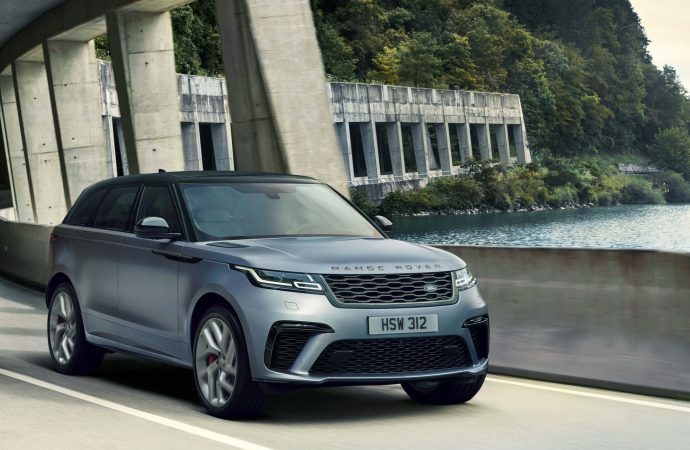 Enhanced by Jaguar Land Rover’s Special Vehicle Operations department, the Velar has been overhauled in order to offer a more dynamic drive than its more conventionally-powered stablemates. Even the all-wheel-drive system has been recalibrated in order for it to better deploy the engine’s power. Exterior changes have been applied to the Velar too. A new front bumper houses larger air intakes, while a revised rear bumper and new quad exhaust finishers can be found at the rear. New lightweight 21-inch alloy wheels sit on all four corners. Inside, you’ll find perforated and quilted seats with 20-way adjustability, fitted alongside a sports steering wheel and aluminium gear shift paddles. The new Range Rover Velar SVAutobiography Dynamic Edition is priced from £86,120.